This is the one. 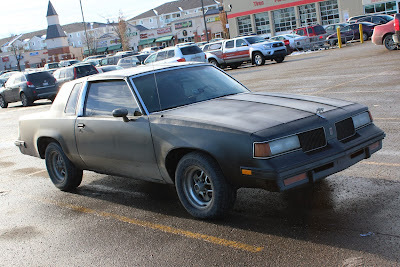 Look closely in the background of any movie scene where the location is supposed to be sketchy or dingy (Usually there are sirens in the background) and you will see a mid to late '80's Oldsmobile Cutlass Supreme much like this one. 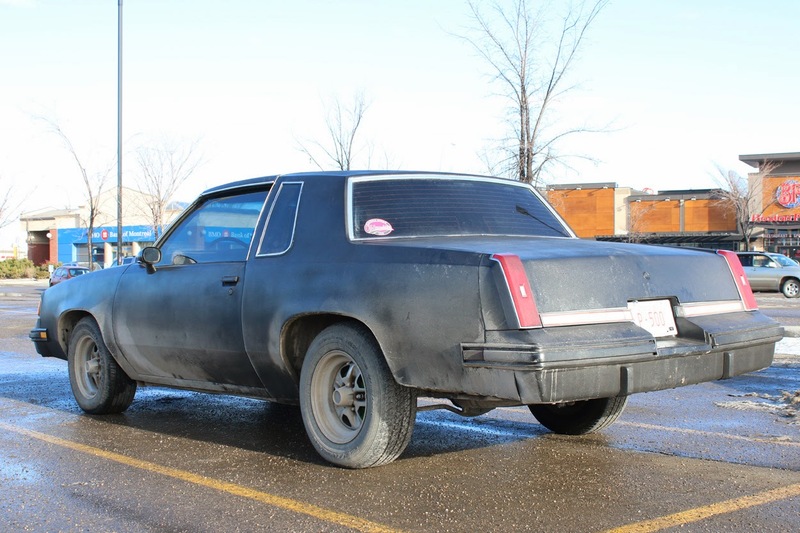 This one features all the hallmarks of the infamous and ubiquitous "ghetto cutlass" including fading purplish window tint, an aftermarket hood ornament and a home brew paint job. 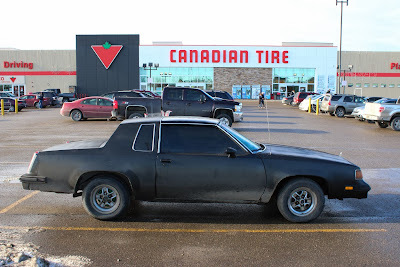 But this low buck looking '80's coupe isn't as proletariat as the patina'd finish would lead you to believe. 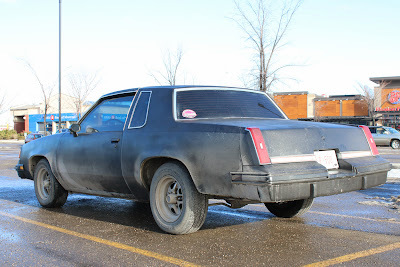 That's because this Cutlass has a secret. 4/5 lug nuts ain't bad I guess. 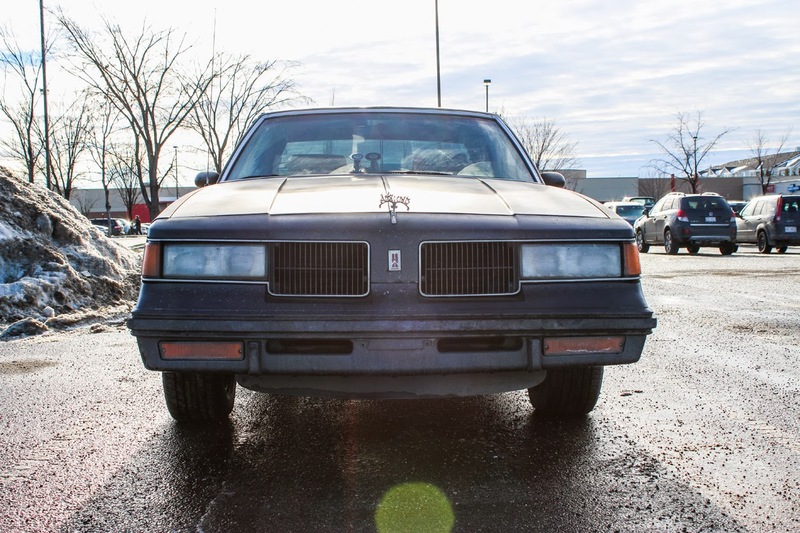 That's right, you're looking at one of only 4,208 Oldsmobile 442's built in 1987. And it's not just a refitted set of wheels; there are a few other clues that confirm that this anonymous looking black coupe is the real deal. In this shot, you can see the low hanging rear anti-roll bar hanging by the differential and the special red pin striping on the rear reflector panel. Oldsmobile's 442 stood for a 4 speed manual transmission, 4 barrel carburetor and 2 exhaust pipes when the model debuted in 1964. 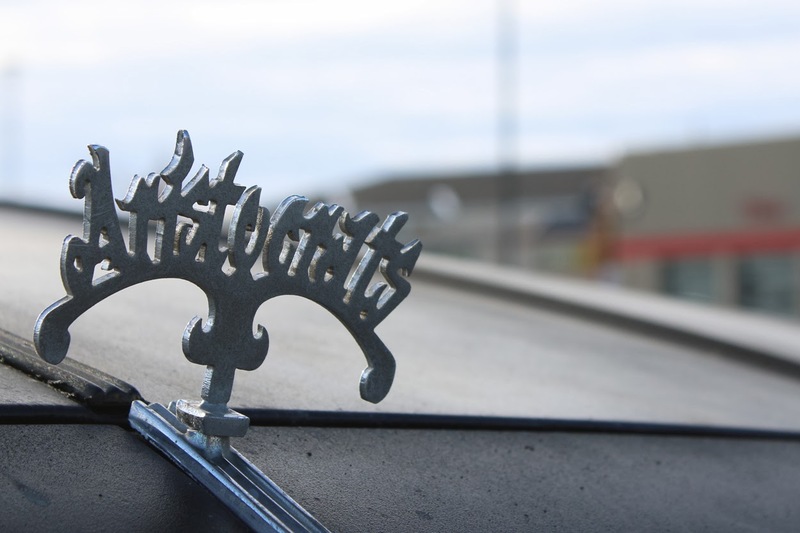 Twenty three years later in 1987 it stood for much the same thing except it was now a four-speed automatic transmission. 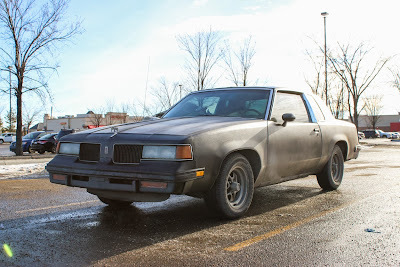 Motivating the whole package was the not-so-great but very Oldsmobile 307 cubic inch V8 which was good for 170 horsepower and a healthy 255 lb. ft. of torque. Zero to sixty times weren't languid but they were hardly brisk either. The only transmission available was a quick shifting version of the standard four-speed auto. Though it's performance might not have been hot even for diluted 1987 standards, like any '80's GM V8 car, its performance can be infinitely upgraded for very reasonable money. These cars fit all manner of different V8 engines and the sky is the limit for tunability. 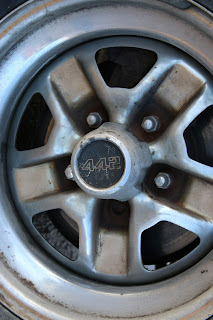 It was this inherent potential that drew many would-be racers to buy second hand 442's. This one bears signs of multiple previous owners. 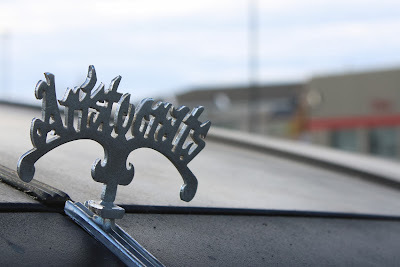 The Aristocrats hood ornament is very lowrider-esque but there it doesn't have the lowered stance, metal flake paint or Dayton wire wheels to back it up. More confusingly, this one features stickers from a Canadian Oldsmobile owners club. Doesn't look like anyones pampered collector car. It also has a child seat in the back so who knows what it's current purpose is. The non-442 versions of these cars are fairly easy to find but spotting a 442 or a clean one is a rare find indeed. 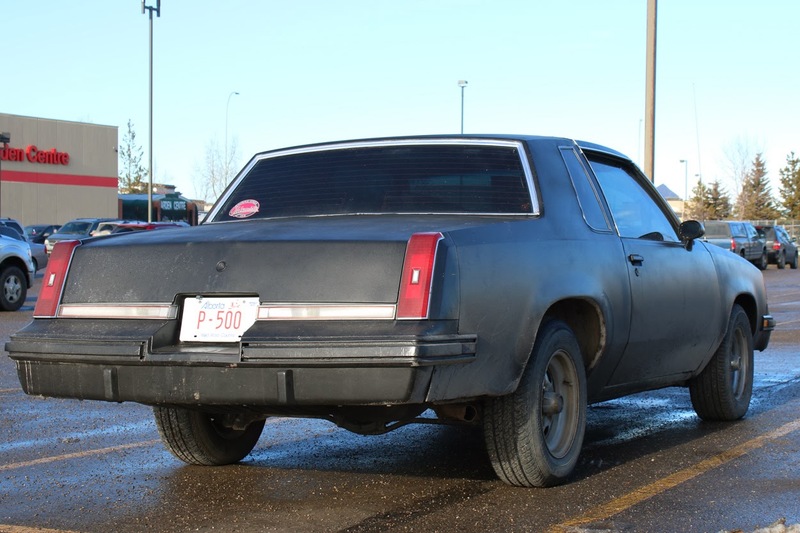 Worn examples can be found cheaply but with the prices of '80's sport coupes on the rise, values might go up. Regardless, it's great to see one of the last carbureted "muscle cars" out on the road.